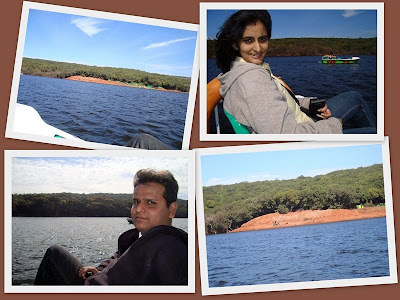 Panchgani | Exploring Mystic India! 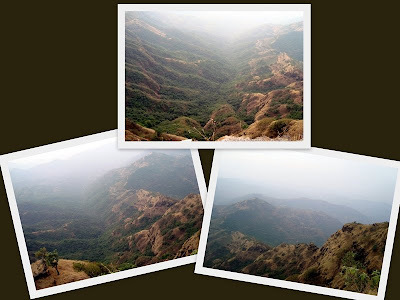 Known as the queen of hill stations in Maharashtra, the word Mahabaleshwar means, “a God with great might”. 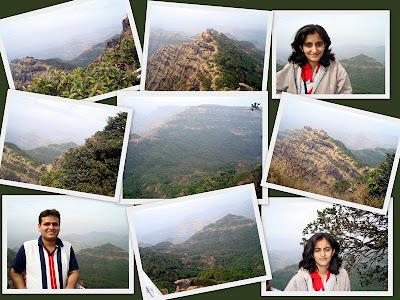 We started our leg of the trip by visiting the Mahabal temple in located in Old Mahabaleshwar. 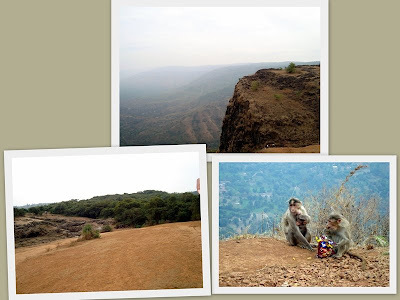 After getting the blessings of the Hanuman deity, we proceeded on a short trek to the “Plateau” point. 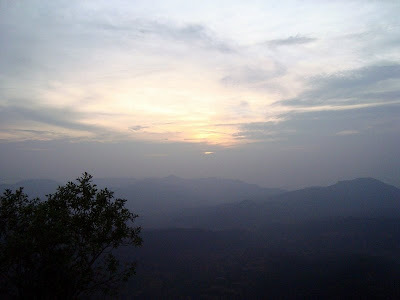 The point gives a panoramic view of the dense jungles around the hill station. On one end of the point, you can see the “king’s seat”. 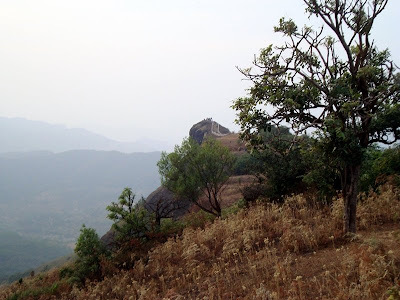 This is the spot where the Maratha King Shivaji used to sit and strategize his war moves. 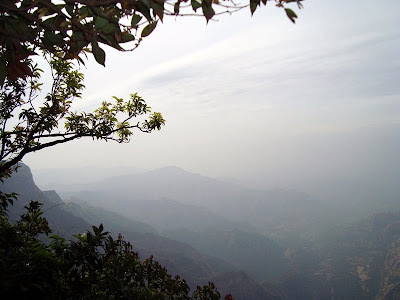 By the time we began our trip, the sun had already risen, so there was no real reason to go to the “Sunrise point”, also known as the “Wilson Point” which is the highest point of the hill station. Next stop was a small stream off the “Lingamala” waterfalls. 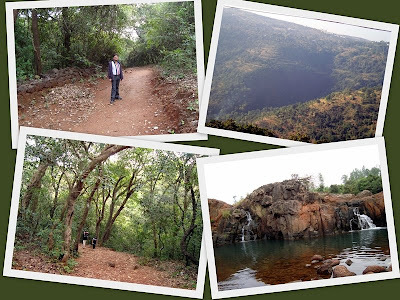 The trek leading to the fall was absolutely enchanting. In fact the picturesque tall trees remind you of popular computer wallpapers! In a later leg of our journey, we saw a huge hole in a mountain from where the falls actually can be seen during monsoons. (We couldn’t witness it because we went during winter). 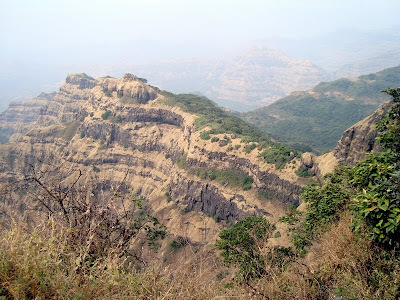 Lord Lodwick was the first European to set foot on the Mahabaleshwar hills. A monument commemorating him has been erected in his honor and memory. 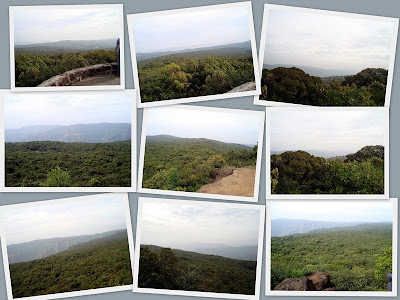 The “Lodwick’s point” overlooks most photographed point of Mahabaleshwar. Also called as the “Needle hole point” locally, the point is actually the Kate’s point at a distance! The Lodwick’s point is also quite a favorite for many Bollywood films. Next stop was the Kate’s point and the Echo point. Both lie adjacent to each other. Apparently it takes around 2-4 seconds for the echo to return from the echo point. Lord Malcolm was the first Governor of Mahabaleshwar; he had two daughters, Kate and Marjorie. There are points named after all three of them. Standing atop the Kate’s point is like riding an elephant; you are actually on the back of the elephant hill seen from the Lodwick’s point! 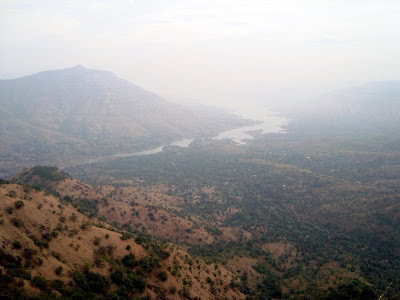 From the Kate’s point you can see both sides of the Krishna River Valley. The Krishna River originates here and runs to the south of India. 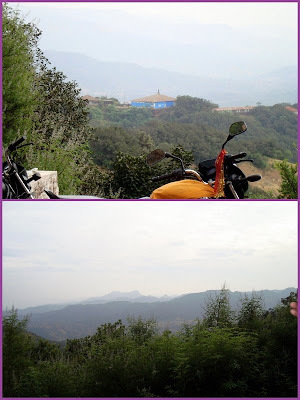 Next up was a quick trek to three more points of the hill station. There were originally four points here; but the Window point was toppled over the click because of the Latur earthquake. The first of the three points was the “Hunters point”. It was named so because it was one of the most popular hunting spots for the Brits during the pre-independence era. The second was the Malcolm’s point. It is said that when the sun’s rays hit the mountain at this point, it looks like it’s made of golden threads! On our way out, we decided to feast on the local savories. 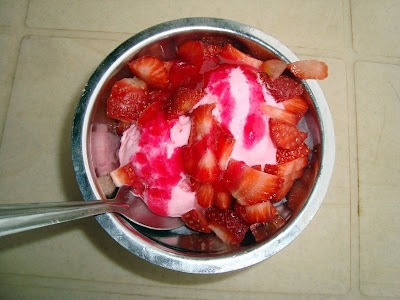 What better food to gorge on than home churned strawberry ice-cream, topped with fresh strawberry crush and freshly cut strawberries and all that for a mere 35 bucks! On our way back, we stopped to enjoy the second highest point of the hill station, the Connaught peak. 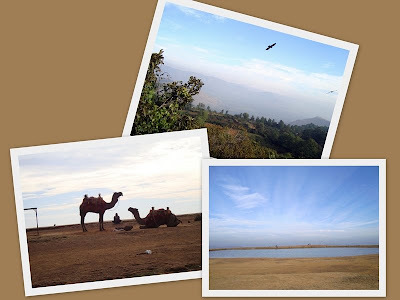 It offers an amazing panoramic view of the Venna Lake and Krishna Valley. You can also see the controversial “Dhoom” dam over the Krishna River. 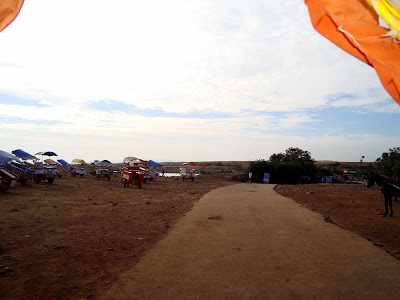 To the right you can witness a small village which was portrayed as the Charanpur village in the movie Swades. We then went on to visit the sacred Panchganga temple. 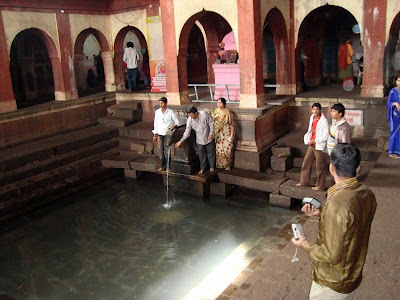 This is where the sangam of the five main rivers, Koyna, Krishna , Venna, Savitri and Gayatri. River Krishna is one of the longest rivers in India. It travels 1,300 Kms from Mahabaleshwar to join the Bay of Bengal near Andhra Pradesh. River Krishna as Hindus believe that Krishna is the presense of Lord Vishnu himself and its tributaries Venna and Koyana are Shiva and Brahma respectively. Next we visited the Marjorie’s Point, which is also known as the suicide point. The fact that people come all the way to such beautiful and peaceful place to die is both baffling and amusing! The sun was almost setting and it was time to proceed to see the sunset point. The sunset point is also called as the Bombay point. At a 1.5Km trek is the Elephant’s Head point. The mountain peak looks like a resting elephant, but we were too exhausted to walk that far and back to our vehicle thanks to a hectic and long travel day. The next day en-route to Panchgani, we stopped over to visit the Parsi point and the Mala Factory. 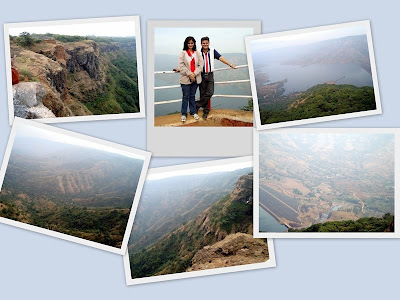 The Parsi point offers a panoramic view of the entire Mahabaleshwar. The Mala Factory makes a wide variety of squashes, lemonades, fresh fruit juices.You can purchase all this and fresh strawberries from their farm. Photography is strictly disallowed as we saw litchi squash being made. 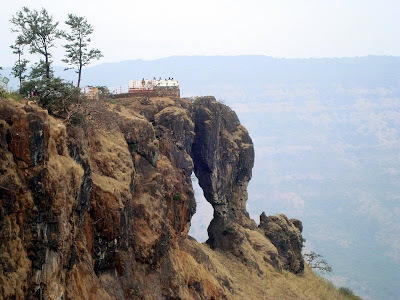 Pratapgad or the “Fort of Victory”, located currently in Satara district of Maharashtra, was built in 1656 after it was won by Shivaji in the famous Battle of Pratapgad which was fought below the fort on November 10, 1659. The base of the fort had a tunnel which could house around 40 maratha warriors, which has now been destroyed to make way for the road lead to the fort. The fort held strategic importance since it could watch over a large region ensuring greater regional control. The architectural plans were laid down by Moropant Trimbak Pingle at the command of Shivaji, who has indeed done a marvelous job! 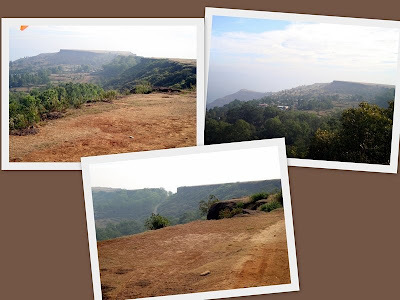 The fort is currently owned by Udayan Raje Bhosale, the heir of the Satara princely state. 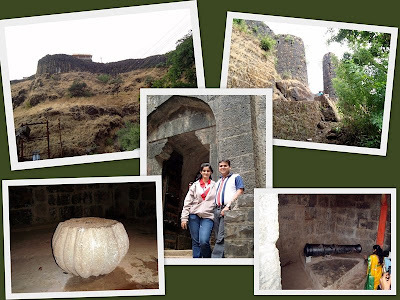 A large number of descents of the Maratha warriors still live inside the fort which closes every day at 6pm sharp. The most amazing thing about this fort is the fact that you cannot locate the entrance unless you stare directly at the door. It looks like just another pillar from a distance. This was one of the major defense mechanisms. The fort is divided into two parts, that is, the upper or small fort and the lower or bigger fort. It was believed that no fort could be captured in the true sense unless the upper fort has been seized. 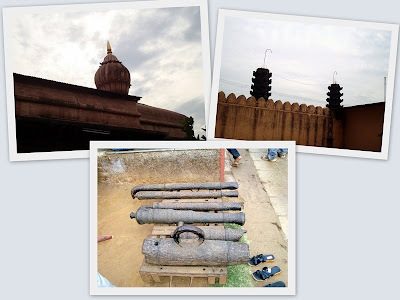 At the entrance we saw a traditional lamp holder and cannon on display. En-route to the fort is the famous tomb of Afzal Khan. 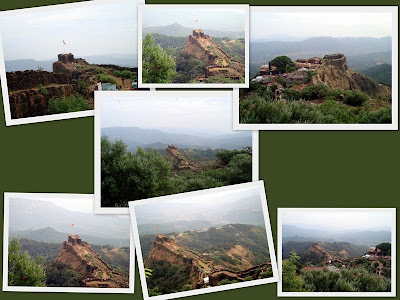 History has it that Shivaji wanted to capture the Mogul owned fort quite desperately. For that reason, he had a meeting with the Bijapur general Afzal Khan. The five foot tall Shivaji, who was very much shorter than the seven foot general had to be extremely quick witted to outnumber the giant. Under the pretense of hugging him, ripped his stomach with an iron knuckles called wagh nakhi. 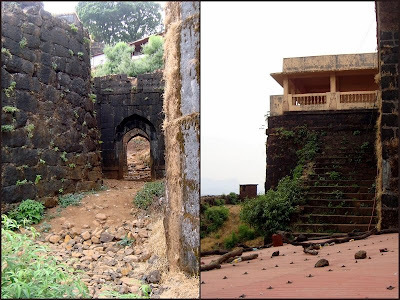 The body of Afzal Khan is buried near the fort, and his head is buried at the Raigad fort. Owing to a dispute, the tomb here is closed for public entry. While constructing the fort at such a high altitude of 3543 feet above sea level, water is scarce. There is a well in the lower part of the fort, although the water is no longer fit for consumption. A few feet from the pond, we saw the entrance from where the royal procession used to lead to the Bhavani temple at the top of upper the fort. The entrance is closed now closed as it is not considered safe to ply. Apart from the Tulja Bhavani temple, the fort also has a Shiva temple, the ling was self-formed, and hence the temple was constructed. The dome of the temple has a pure gold peak and there are huge structures where oil lamps were lit commemorating major Hindu festivals. We also saw some of the hand held weapons used by the warriors then. Some weigh as much as one ton! 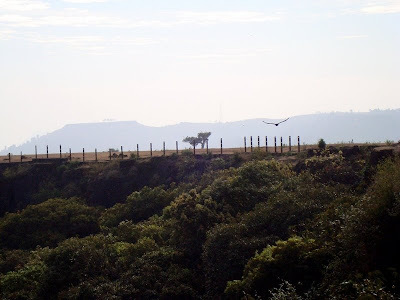 The fort has four view towers to patrol over the dense forests. The forests used to be so dense that sunlight would barely touch the ground for days together. 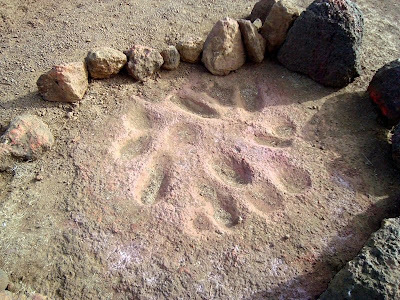 Three of these can be seen on the tourist route and the fourth is inside the Malva village. This historic photo graph is the most amazing and landmark image of the fort as it feature in the fourth standard History books under the SSC curriculum. As we proceeded through our trip, our amazing guide showed us trap exits, there are four such trap exits which open to the mountain slope. These used to help the warriors to secure the upper fort even after the lower one was captured. How it worked was, once lower fort was captured, the warriors would lock the gates of the upper fort, slide out of these trap exits and trap exits, trapping the enemy in between. 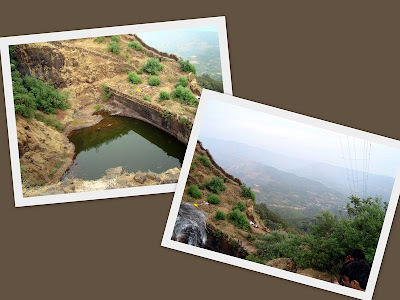 Once atop the upper fort, our guide took us to this point where the wall of the fort falls on the exact boundary of Satara and Raigad districts. This place is also known as Kadelot, meaning throw overboard. Shivaji was a very fair and just ruler. The only punishment for mistrust was to be tied in a sack and thrown off the mountain. Since the trust factor was very high among the marathas not too many incidents of kadelot is recorded in history. Once at the end of the fort, we visited the Tulja Bhavani temple and the court area. Once the Brits came into power, they destroyed major portion of the upper fort, which included the court area and the royal sleeping rooms. 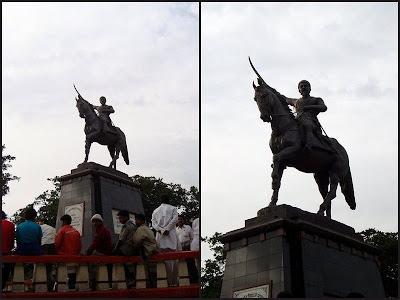 A bronze statue of Shivaji Maharaj on horseback was erected and unveiled where the royal suites were located in 1957 by Pandit Jawaharlal Nehru, the then Prime Minister of India. Panchagani by itself is a small town, which is made up of five table land mountains from which it derives its name. 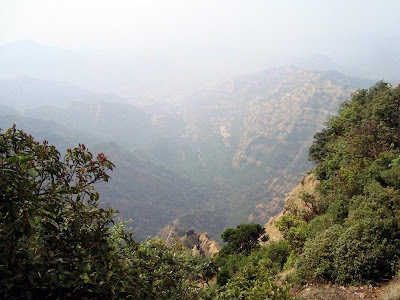 The smaller hill station is situated at an approximate altitude of 1330 meters, it is around 38 meters below Mahabaleshwar and has the British Raaj stamped all over it. 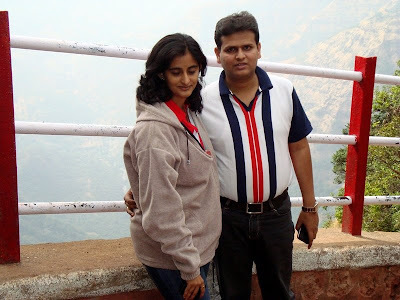 Founded in 1853 by John Chesson, the hill station was basically a recommendation to the East India Company as a suitable place for the wives and children of the officers of the Company to reside instead of going back to England frequently. 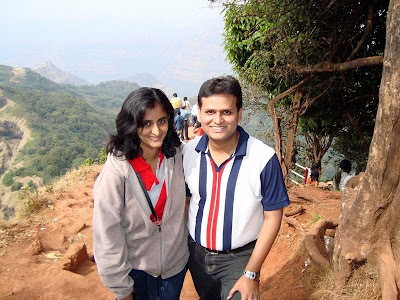 Since then, Panchgani has been a abode to many popular boarding schools. 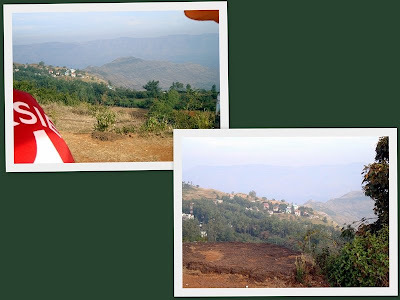 In fact the famous “Taare Zameen pe” school is located in Panchgani. You can take a horse or you can hire a horse cart like we did. The ride lasts around 90 odd minutes during which you will be taken around the centrally located table land. First up we saw 6 pair of foot marks, which incidentally belong to the Pandavas and Draupadi, who had rested on the post during their vanvaas. 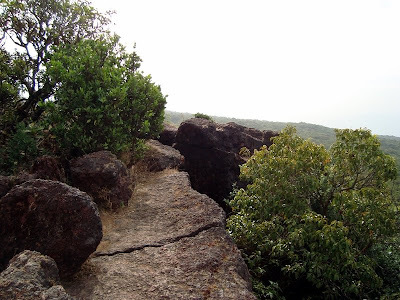 The Devil’s kitchen, situate to the south of Tableland was also one of their pit stops during their long exile. And at a distance, we could see the “One tree point”. This was the spot where the famous song from the film Raja Hindustani was shot. In fact, the entire movie was shot in and around this area. We could also see the other four table lands. Our cart rider told us that this crevice was where the famous hand glider scene between Amitabh Bachchan and Amjed Ali was shot for the film Dostana. At the other end of the table land lies Sidney Point, a flattened area on the apex of a conical hill. This point especially highlights the fine Parsi and Colonial style houses and architecture. 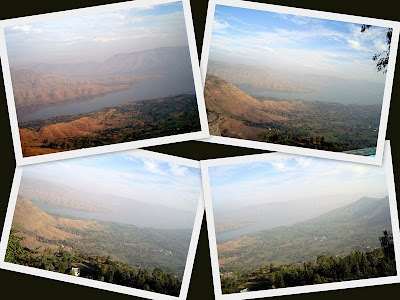 From this point can see Wai village and the Sanatorium in the distance and also the sparkling waters of Dhoom Dam.Since we had already had a good view from the Kate’s point and were pressed for time, we did not venture that far. As we ended our leg exploring Panchagani we witnessed nature at its very best, a sparking lake in the middle of the table land and eagles soaring the high skies. If you are adventurous, you can also ride Camels across the table land. On our way back, we had a very relaxing pedal boat ride across the Venna Lake. What a perfect way to end a perfect trip! 20th December – 21st December, 2008.